Damien Hirst: the dollars and sense? Say what you like about British artist Damien Hirst, and everyone from international art critics to London cabbies does, he certainly pulls a crowd. At the Tate Modern in London, the queue of those waiting to see his famous For the Love of God – his 2007 platinum cast of a skull encrusted with diamonds, teeth model's own – was of Disneyland length. And those attending his first major retrospective which runs until September 9 and takes over one floor of the gallery space above represented every possible demographic, speaking a dozen different languages, sometimes in hushed voices as they expressed their admiration or derision of the works. Effervescent French schoolkids and immaculately dressed snootycrats from the art cognoscenti sniffed the air at a large glass cubicle in which thousands of blowflies buzzed round the bloody and severed head of a cow or were zapped into a pile of black bodies by the electrocuting lamp. Another day of life, death and voyeurism in the world of contemporary art. A retrospective of Hirst -- born in 1965 and whose first major work coincided with the cocky swagger of Britpop – allows the casual and the critical observer the opportunity to separate the mere bagatelles from the genuinely worthwhile. And there have been plenty of both in Hirst's career, as notable for headlines and banalities as for the latent power, rare beauty and genuine significance of some work. There's little to be said about What Goes Up Must Come Down from 1994 – a ping pong ball held aloft by the air from a hairdryer – but then there are whole rooms of installations and stand-alone work which are commanding. In the same year, 1988, as he was offering primitively arranged and poorly rendered multi-coloured boxes (Boxes, an unusually simple title from a man who came to recognise the associative power of naming), Hirst was embarking on a series which was thought-provoking and undeniably possessed of a strange beauty. His Medicine Cabinets – detailed arrangements of pharmaceutical packages, pill bottles and other contents of chemist shop shelves – say something about the age of dependency, pain relief and the familiarity of self-medicating. One whole room of these – with museum-like displays of highly polished surgical equipment – offers an almost overpowering sense of the chilling and orderly clinicalness of the modern era. His collections of various species of fish in formaldehyde-filled glass cases within larger cabinets are mesmerisingly quiet even though they evoke activity, and the idea reaches its zenith in medicine cabinets where facsimiles of pills or discerning displays of cigarette butts elevate the mundane into objects of study in visual rhythms like a musical score or a wall of arcane hieroglyphics. The installation In and Out of Love is a humid, temperature-controlled room of living (and dying) butterflies slows the pace to allow for a concentration on the creatures' fragile beauty and the transience of life, although also raises “the zoo question” by the very nature of its creation. But undeniably impressive are the mandala and stained-glass window designs referenced in the massive, symmetrical arrangements of butterfly wings. has its power both magnified and constrained, the sheep (one black, one white) are gentle memento mori, their solitariness spotlighting individuality and beauty seen only when split from the herd, perhaps a useful metaphor when people desperately Facebook their every waking thought in the hope of acknowledgment of their uniqueness. Hard to believe however, that this is same Hirst who offers up the gimmicky Spin Paintings – massive canvases rotated at speed and with paint dropped on them to create abstract patterns. They were called dabstracts when you made your own for a couple of dollars at the Easter Show. And his Spot Paintings – multicoloured dots in random order on small or wall-filling canvases – can be infuriatingly inconsequential or impressive by virtue of their size. However all are watery and vapid in the comparison with the work of Japanese artist Yayoi Kusama's dot-filled installations – as anyone who saw her Wellington City Gallery exhibition in 2009 would attest – in another space in the Tate Modern. And this is the dichotomy of Hirst's work, the mediocre alongside the meritorious in the same intellectual landscape. Both, he seems to suggest, are of equal weight. That skull however – tellingly given a separate space which invites queuing as at the tomb of an Egyptian pharaoh or an embalmed communist leader – is another matter. Billed as one of his most iconic works, it is a description which invites analysis. If an icon is something which has power and meaning beyond itself – and not in the debased current usage of well known – then what does the astutely titled For the Love of God stand for? Like much of Hirst's best work, its value is inherent and associative simultaneously. The worth of Hirst's work became about the numbers, fitting in the commodity trading, hyper-inflated art market in which he lives. He has been a market leader, his work snapped up by investors and his reputation pumped by those in whose best interests it was to see the market primed: curators, dealers, corporate collectors and other parasitic fish swimming around the Great White Hirst. 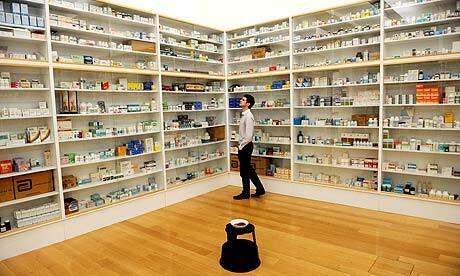 It is easy, and right, to be sceptical about all this at which Hirst's art is the epicentre. The retrospective – selective of course – gives enough ammunition to the cynical. The headlines about the skull – priced at US$100 million, a sum it failed to sell for – meant it commanded as much attention in the Business section as it did in Arts. No art work however should be evaluated by the obscenely inflated price the market or in this case, the artist, has place on it. Hirst accepted, encouraged, manipulated and fed that voracious world, but in one small sense he has also been its victim. The reproduction on tee shirts, posters and a gift shop full of cash'n'carry Hirst detritus (hoodies, coffee cups, skateboards, umbrellas and all the rest bearing his imprint) means the power of some work is tragically trivialised. 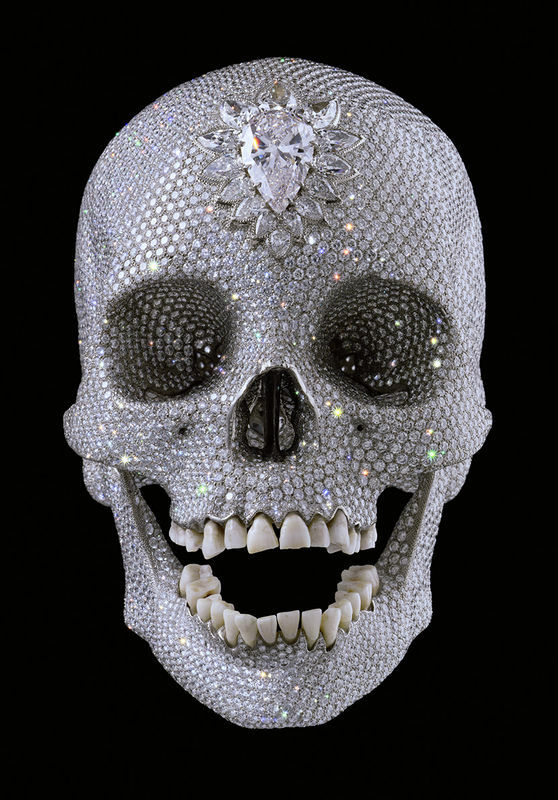 Nothing can prepare you for the breathtaking beauty of that diamond encrusted skull, displayed in a darkened room under lighting which illuminates its glittering surface and multiple meanings. Damien Hirst, the enfant terrible and sometimes terrifique, doubtless knows it: the astonishing For the Love of God resonates like a holy artifact in an unholy age. Graham Reid of www.elsewhere.co.nz flew to London with assistance from Cathay Pacific and Visit England.